This beautiful black, gray, and white scarf was from a fund raiser in Naples, NY. Each table paid a fee towards the fire department & proceeds from what each table sold they kept. In this case, the money went towards the Narcissa Prentiss House in Prattsburgh, NY – her birthplace. She was a pioneer, missionary, and teacher who traveled with her husband, a minister, from the East Coast to Oregon. Narcissa rode sidesaddled and one of the first two white women to cross the Continental Divide. The house would be interesting to see with artifacts, quilts, antique clothing, a room dedicated to the Pratt family, founders of Prattsburgh. I’m very glad I had the opportunity to take this class from Margaret Kinsey. 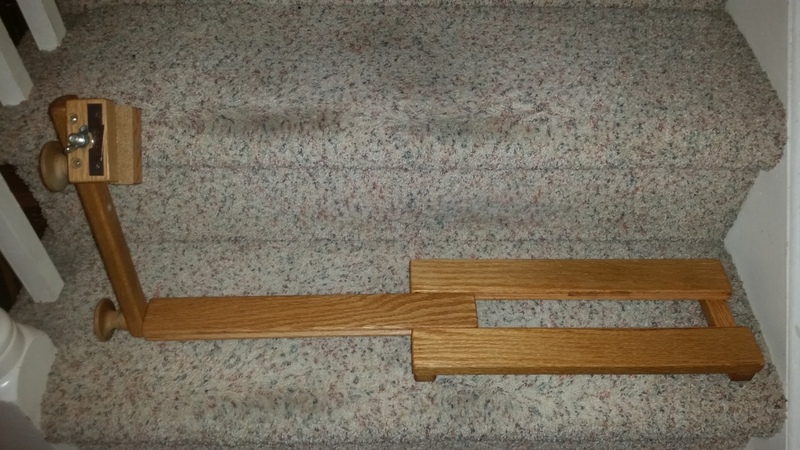 It was an excellent piece for a beginner. Not only was working with gold new for me but so was working on black & it was not easy. So, blackwork on black background provided the second challenge. However, I did it!! 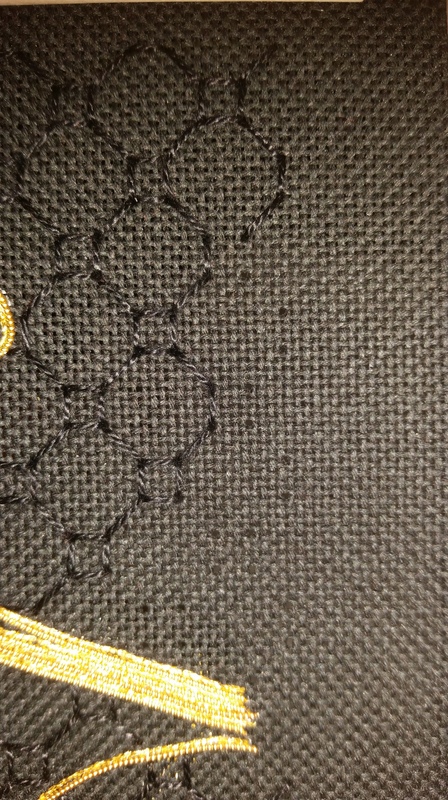 And, I pre-poked the places to stitch the blackwork. In that way I was able to see better & be sure everything lined up. Not sure what the “needlepoint police” would have to say about that but it made my life easier! And, here is the finished piece – looking good times three!! 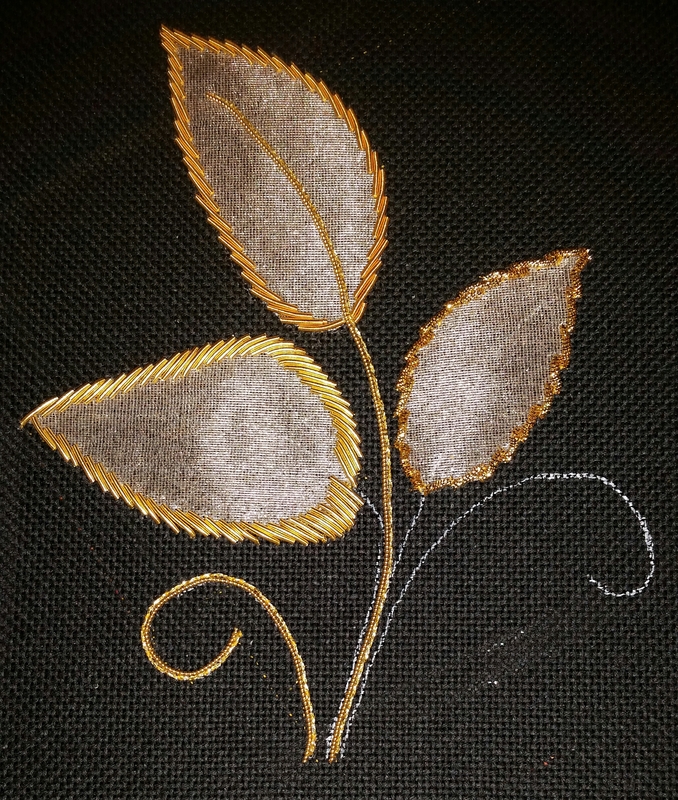 I am very happy with my first goldwork piece. 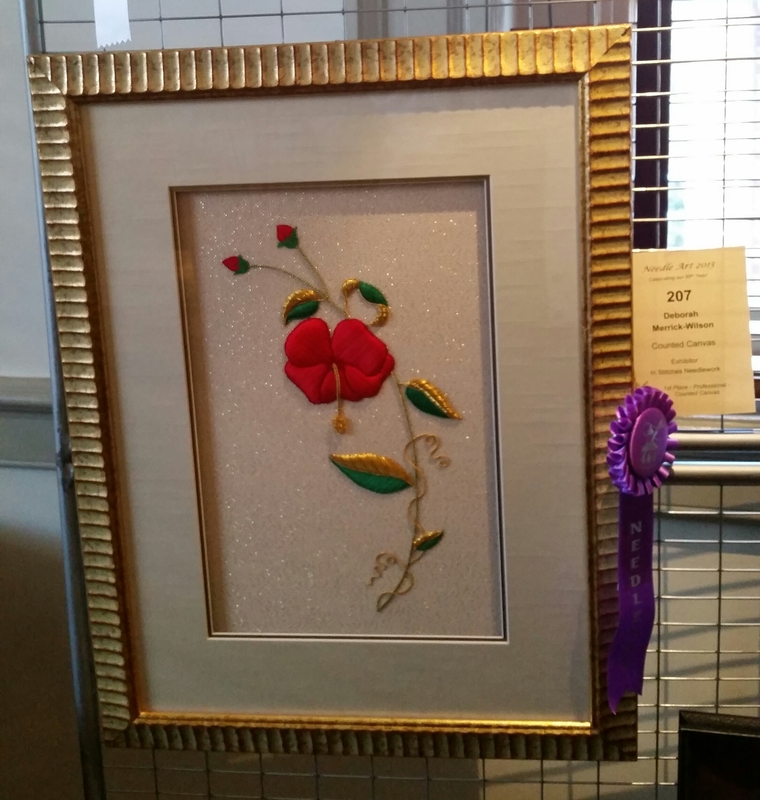 It was interesting to see that the judges (a panel of regionally known needle art professionals) awarded 1st place and honorable mention awards (no 2nd/3rd place). They also awarded 2 Judges Choice, a Special Category Award for Celebrate with Needle & Thread, and Best in Show. The exhibit & venue reminded Bill & I of Woodlawn. The pieces approximately 115 pieces were located throughout the house and lighting was not always great. But, you could get a lot closer. They were mostly counted cross stitch on various grounds (Aida, linen, Congress Cloth, etc), a lot of samplers, 12 categorized as counted canvas, goldwork, embroidery, beading, crochet, Romanian Point Lace, and other miscellaneous (including children stitching felted pieces). Signs were out “Do not touch” & the only reference to photography was not to use a flash in the Mansion booklet. So, I am not sharing all the photos on my blog – I will show them to the people in my chapter’s meeting next month. In addition, there was a non-judged category – Heirloom – for older pieces as related to subject, history and stitches. They do not have to be made by the exhibitor nor does the stitcher have to still be living. That may be something I contribute to next year with my grandmother’s work. I’ll think about that! The Judges Choices went to Margaret S (#199) for a 4-panel elaborate case to hold needles/scissors/threads with I think a pin cushion (all beautifully assembled) and to Sherri B for a sampler (the one that most impressed my husband – it was impressive – basically 4 samplers stitched as one). The Special Category Award went to a counted cross stitch design of a woman sitting in front of her ironing board taking a break doing some embroidery with a basket of clothes at her feet and a kitten playing. I thought it was blackwork at first because the outlined areas are filled with a pattern but up close, I could see the crosses. The Best in Show went to a chair categorized as embroidery/thread painting but I have always called it crewel. I can’t imagine ever allowing anyone to sit on it!! Deborah Merrick-Wilson had 2 first place winners. 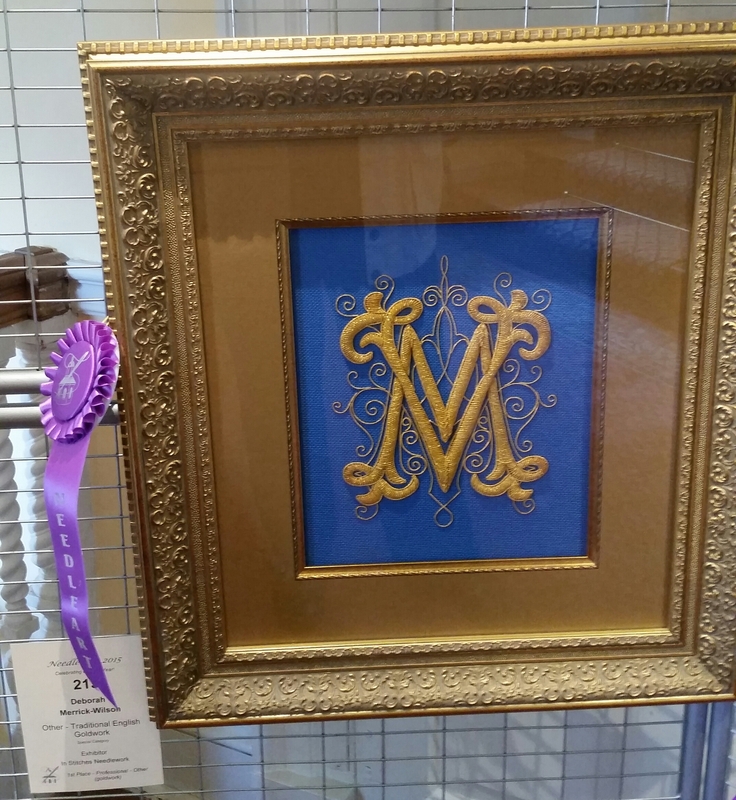 One was traditional English goldwork of a monogram – I only saw a really fancy M but Deborah pointed out the V (now I see it) that she stitched years ago for her good friend and a past member of my ANG Main Line Chapter, Mae V-D who passed away recently. 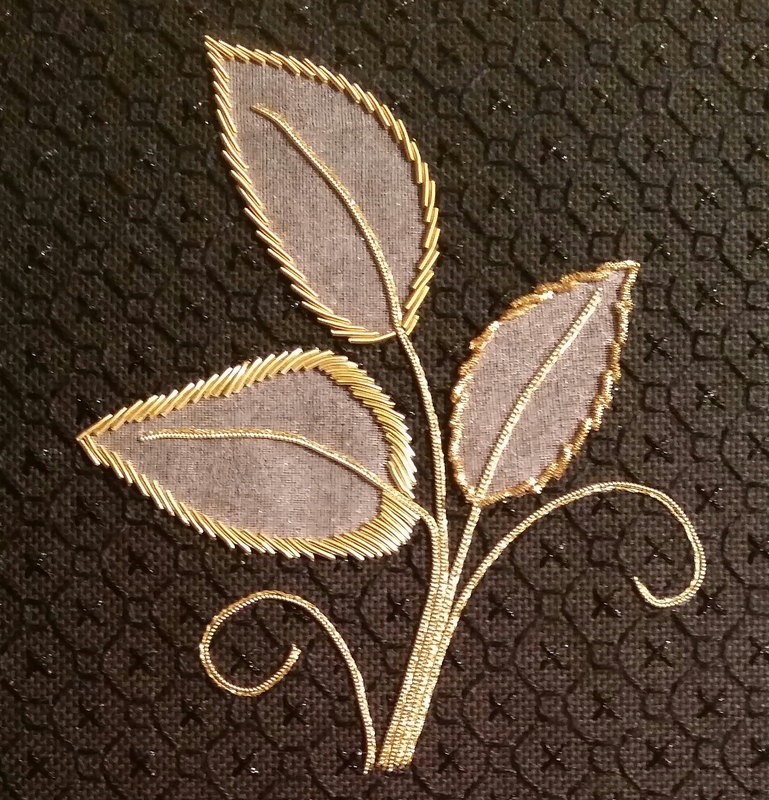 The other piece is a flower and leaves of goldwork with thread stitched on counted canvas. With Deborah’s permission, I can share these photos. Congrats to Deborah! And, either of her 2 small goldwork flowers would be great for another class next year!! I made great progress the last 2 days on Three Leaves, the Margaret Kinsey seminar piece. 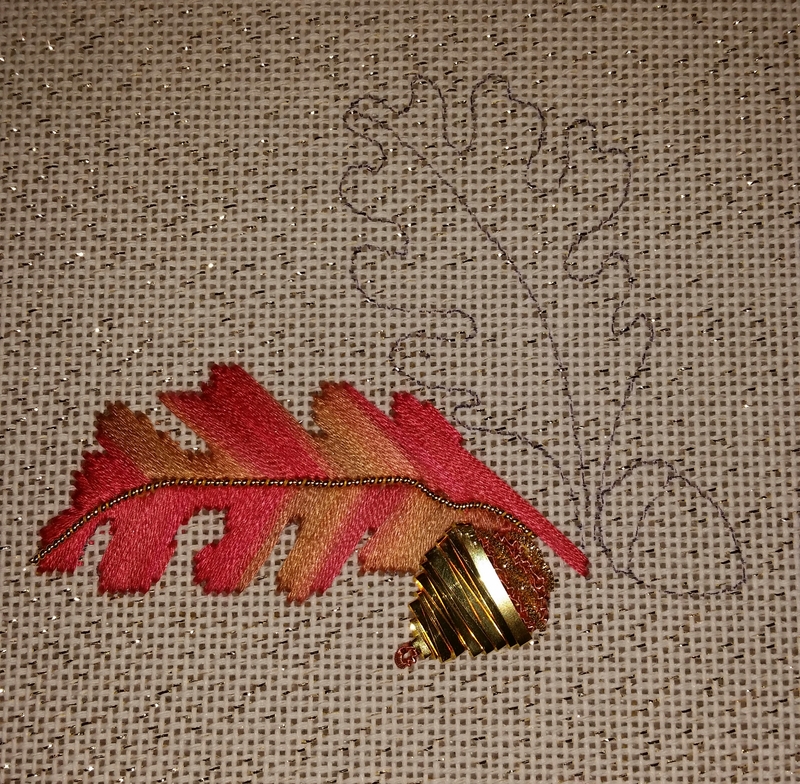 It (goldwork) actually gets easier the more you do it! Isn’t that true of most things? All 3 leaves are outlined now. My bottom left leaf is heavier than the model but that’s ok! I decided to just go full steam ahead and not worry (too much) how good it turns out. I still did enough unstitching. I found the smooth purl and the shape of the 3rd leaf the most difficult. Maybe I should have repositioned the canvas. Now the light dawns! Oh well. I’m happy it felt more comfortable especially since Saturday is my second goldwork class. This will also be a one-day class but with Deborah Wilson (recent Woodlawn winner & author of the goldwork chapter in Amy Bunger’s Cookbook).